GRiT Texas is part of the NICA national GRiT outreach program. You can find more details about the national program here. Who is part of the GRiT Texas? All girls who participate in the Texas Interscholastic Mountain Bike League. All girls who participate in a GRiT Event. All women who volunteer for the Texas Interscholastic Mountain Bike League as coaches, ride leaders or other roles. 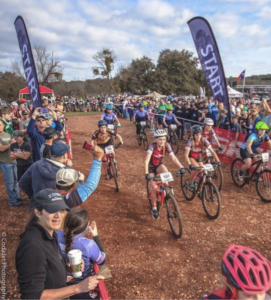 All women and girls who support getting more girls on bikes and are committed to helping increase numbers of girls participating in the Texas Interscholastic Mountain Bike League. Where is GRiT at the Races? Checkout the GRiT Tent at each race in the Infield. We are looking to host GRiT Pre-Ride and Social Events at a few of the races this season. Details will be posted in each Race Flyer. Volunteer to assist and ensure there is a GRiT booth at each race weekend. Better Yet, Volunteer to plan and run a race day tent activity. We would love to use the great ideas of Moms, female athletes, team supporters and parents/guardians. Outcome: More individuals, more teams, and more ideas expand female athlete involvement in the GRiT Community. We are planning GRiT clinics in the near future. Stay tuned to facebook, GroupMe and email for announcements. Spread the word! 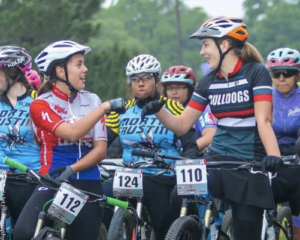 about the TEXAS Interscholastic Mountain Bike League to all the girls and women you know! Tell them about the GRiT TEXAS events. Direct them to the Texas Interscholastic Mountain Bike League Facebook Page or to the Texas Interscholastic Mountain Bike League website. Too Young for the League? Do you know a girl who may be interested in mountain biking but is too young to be part of the league? GRiT has some suggestions! Girls of all ages are welcome to come to the races and participate in the GRiT tent activities. Watching the races and cheering for girls racing is another great activity. For information on youth programs for student-athletes between 7 and 13, please visit: Little Bellas program, your local Mountain Bike Club, or your local regional park district events and programs website. These programs are not affiliated with the Texas Interscholastic Mountain Bike League.